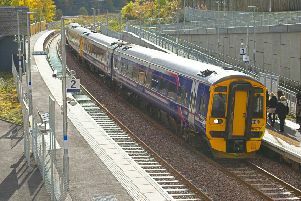 A train on the Borders Railway. Extending the Borders Railway east to Berwick as well as, or instead of, south west to Carlisle is among the ideas suggested for further consideration as part of plans to improve transport links in the region. A draft version of the long-awaited Borders transport corridors study being produced by consultant Jacobs UK has now been published, and it outlines 21 options to be looked into further, including extending the £353m track one way or the other, or both. Adding extra stations to the Edinburgh-Tweedbank track is also suggested. Among the other suggestions to be discussed are dualling the remaining single-carriageway stretches of the A1 between Edinburgh and the English border and carrying out improvement works to the A7 Edinburgh-Carlisle road and A68 Edinburgh-Darlington route. The report has been welcomed by Simon Walton, chairman of the Campaign for Borders Rail. He said: “We have, of course, been awaiting this report, like everyone else in the Borders, and we’re glad it’s finally published and makes copious positive reference to extension of the Borders Railway. “Of course, it was apparent, right from the initial stakeholder meetings, that there is widespread support for extending the Borders Railway to Hawick and Carlisle. “I’m glad that the report reflects that groundswell, and makes many references to extending the railway as a means of promoting economic development right across the Borders. Those findings are in line with the aims of the campaign. “We’ve always promoted railway infrastructure as the most tangible way to achieve the overarching desire for economic development, social inclusion and sustainable growth. “The report confirms many of the campaign’s own findings, in that growth has been stimulated by the existing Borders Railway, and that further investment in the existing line is vital to meet the demand it generates. The draft report, commissioned by Transport Scotland, has also been welcomed by Borders MP and MSP John Lamont and Rachael Hamilton. Berwickshire, Roxburgh and Selkirk MP Mr Lamont said: “The Transport Scotland study highlights what many people in the Borders already know – that connectivity in the area needs to be much better. “The study presents a range of options for improvements, including alternative proposals for the Borders Railway. “ I hope the Scottish Government will listen to the strong public support and economic benefits and choose to extend the line. Ettrick, Roxburgh and Berwickshire MSP Mrs Hamilton added: “This report says nothing that the Scottish Borders doesn’t already know. “The region needs better transport and knows that better transport would improve its economy. Extending the line, opened in September 2015, south to Hawick, via Melrose, would add about 17 miles to its current 30-mile length, and continuing to Carlisle, via Langholm or Newcastleton, recreating the old Waverley Route closed in 1969, would add another 50-plus miles on top of that. Extending it east would also more than double its length, requiring another 40 or so miles of track. The study, developed in partnership with Scottish Borders Council and the South East of Scotland Transport Partnership, will now be subject to further consultation. A council spokesperson said: “We welcome the publication of the pre-appraisal report for the Borders transport corridors study. The consultation period for comments on the draft study ends on Friday, June 1. Scottish Government transport minister Humza Yousaf said: “In our programme for government, a commitment was given to consider the future transport needs of the Scottish Borders, including examining the case for extending the Borders railway, along with potential improvements to the A1, A7 and A68. “This was on top of the commitments already made, such as East Linton and Reston stations, as part of a programme of works aimed at improving capacity to the east of Edinburgh. “This report is an important milestone in delivering that commitment. “The Borders transport corridors study considered a number of issues including accessibility in the Borders and links between its communities and the key markets of Edinburgh, Carlisle and Newcastle. “The draft study has identified a range of options, including improved bus services, active travel, road and rail infrastructure in the region, which will be taken forward for more detailed appraisal in the second strategic transport projects review. “This national review will ensure that we deliver transport improvements for all of Scotland which are fit for the 21st century. “The study has been developed in partnership with Scottish Borders Council and SEStran, and I was delighted to see the level of public interest.